I am super excited about this show. I hope it is as good as I have built it up to be. p.s. I am even MORE excited about Amy Sherman Palladino's new HBO show about "a complicated relationship between three adult sisters". FYI: I have two adult sisters. I saw that she was going to be on tv again and thought you would be happy. Miss you! hi! i've blog stalked you from the contest for that gorgeous necklace! well..actually i clicked the first name i saw and i'm so SO glad I did! I am completely enchanted by your blog! I am inspired by your words and your outlook on life. and we were probably separated at birth as we have the same exact hobbies! I am probably going to blog about the advice John gave you today. It went straight to my heart. I can't wait to hear what you thought about Parenthood. 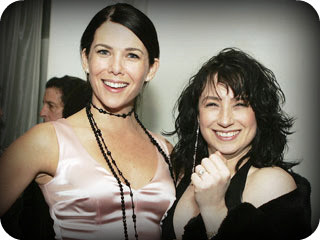 I liked the show, but it's SO hard to see Lauren Graham as anything but Lorelei Gilmore. I do think that the original casting of Maura Tierney was spot on, but of course I love my girl Lauren and think she's going to be GREAT. I am so excited to hear about this new venture for Amy Sherman Palladino! Imagine what she can do on HBO! I looooooooove Gilmore Girls and I miss it so much. I have the last two weeks of Parenthood on my DVR right now, haven't had a chance to really watch it but I did watch about half of the first episode and I have to say, I was happy to see that Lauren carries on the wittiness (maybe not AS much) into the new show. I saw her on Ellen too and that just cracked me up. I didn't know Amy was doing a new show though, yay! I saw in your profile you are moving to WA state, we are too. Are you still planning the move or have you already done it? Oh, goodness... I wish I had seen her on Ellen. I'll let you know if I hear anything else about Amy's HBO series. We did move to Washington about 10 months ago. We are in Issaquah right not. It is a truly beautiful place and I know that you will LOVE it. When do you plan to move?